The University of California Libraries have planned a variety of events this year in order to explore and celebrate issues related to open access (OA). Find one near you! Stop by to learn more about open access and how it impacts you. We have lots of updates to share about open access publishing, open data, and open science, all brought to you by three representatives from UCSF’s newly formed Open Science Group! Plus cookies and swag. Followed by a screening of Paywall: the Business of Scholarship. Open to the UCSF community. Hear from three experts about recent UC initiatives designed to accelerate the transition of scholarly publishing to open access. OpenCon is an international meeting for early career researchers to help advance open access, open data, and open education. The UCSF Open Science Group, in conjunction with the Library, will be hosting a livestream on the first day of the event. Register, connect, and use your researcher ID in grants, data, publications and other academic activities. Sign-up or update your ORCiD – we’ll show you how, give you a cookie, and the department with the most ORCiDs wins a prize! Find out what the UC and the UC San Diego Library offer to ease and open up your publishing opportunities. Hear from Dan Morgan, Publisher at UCPress about the latest efforts to transition to open access publishing. Lunch will be provided; registration required. Paywall, directed by Jason Schmitt, Chair of COMM & Media at Clarkson University, is a documentary film that investigates the need for open access to research and science. Light refreshments will be served. This roundtable discussion, facilitated by Sara Lafia (Center for Spatial Studies) and Jon Jablonski (Interdisciplinary Research Collaboratory), will discuss barriers to spatial data discovery; explore opportunities for broadening access to spatial research data; discuss challenges of opening access to spatial data across its lifecycle; and conclude with proposed future directions. Considering an alternative to the traditional PhD tenure track of teaching, research, and service? Scholar-publishers Eileen Joy and Vincent W.J. van Gerven Oei will discuss their training and careers as scholars in the humanities and social sciences, working both within and outside of traditional university spaces — and their reasons for choosing to run an independent, academic press together while also pursuing their individual scholarly and art-practice projects. University Librarian Kristin Antelman will provide an update on current negotiations between UC libraries and a major publisher. The OA2020 Initiative and developing UCSB’s open access roadmap will also be discussed. Drop by for information on open access publishing opportunities, UC’s open access policies, eScholarship, the UC Publication Management System, the UCSB scholarly publishing discussion list, 15-minute presentations on academic publishing, one-on-one consultations, and related services. Or just stop by to grab a scholarly communication brochure and or some publisher swag to go. The University of California, Riverside Library will host an event series which will kick off on Monday, October 22, with workshops held each afternoon from 3:00 pm – 4:30 pm, Monday through Thursday in the Orbach Library, Room 122. Publishing the research result is the major goal of researchers. Knowing some of the crucial issues related to publishing will help save your time and make a good publishing plan. We will discuss ten such important issues that a researcher must know. The session will also discuss how library can help our researchers in this regard. Finding and Using Open Data. This workshop will discuss differences between open, shared, and closed data; identify places to find open data; and, steps to take when creating a dataset using open data. QGIS is a free and open source geographic information system. It allows users to create, edit, visualize, analyze and publish geospatial information on Windows, Mac, Linux, and BSD. This workshop will introduce some of the basic mapping functions available in QGIS. Open Science Framework – A Free Tool for Research Collaboration. Please join us in creating a fantastical (but well-organized) research project in one hour in the (free!) Open Science Framework (OSF). OSF is not just for Science, it can be used for any kind of project. It is a tool to keep the documentation and communication of a project organized and accessible to anyone in the group (and beyond if desired). Let’s work together to see whether or how this tool might help us enhance the efficiency and visibility of our work. Paywall: The Business of Scholarship is a documentary which focuses on the need for open access to research and science, questions the rationale behind the $25.2 billion a year that flows into for-profit academic publishers, examines the 35-40% profit margin associated with the top academic publisher Elsevier, often greater than some of the most profitable tech companies like Apple and Google. This screening will be followed by discussion moderated by our Scholarly Communication librarians, Jennifer Chan and Marty Brennan. Did we mention there will be FREE POPCORN? What is Open Access and why should YOU care? Discover open access and why it is good for you and your research! Identify quality open access venues so your research is accessible by the world. Use the latest tools to explore the world of research already openly available, and expand your knowledge base. Bring your lunch – drinks and snacks will be provided as well. Tour the many ways the UCLA library supports Open Access. Learn about the UC Open Access policy and the systems that support it, and open access initiatives at UC Press. Connect with support services the library offers across the research lifecycle. Help us brainstorm new ways we can support YOU in these efforts. A Panel discussion on economic models for scholarly publishing. 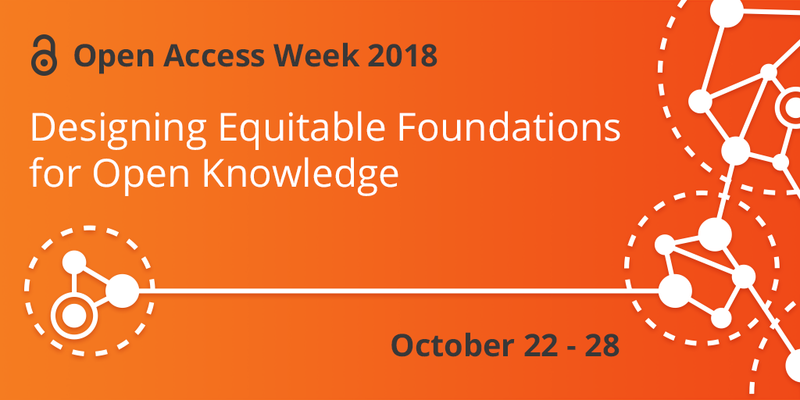 There will be deliberations about redirecting funding toward sustainable open access publishing, a framework addressed in the 2018 Pathways to Open Access toolkit and the in-person event at UC Berkeley on October 16-17. Lunch will be provided. Reservations are encouraged. These sessions demonstrate services and training available from the library’s Digital Scholarship Services (DSS) department. There will be multiple stations to present services and supporting teaching material for a variety of topics for graduate students and interested campus members who may want to know a little about a topic before committing to a class (e.g., Software Carpentry) or longer sessions. DSS staff members will have laptops to demonstrate resources and help researchers signing up for ORCID. There will be showing of a new documentary that examines the world of academic publishing and the pathways to open-access publishing to address accessible research. The movie will be available for streaming or download in September and can be viewed following the event. There will be a brief introduction about Paywalls, viewing the movie, followed by discussion. Lunch will be provided. Reservations are encouraged. Thursday, October 25, 2018, 12:00 pm – 1:30 pm, Humanities Gateway 1010. Co-sponsored by the Center for Excellence in Writing and Communication. As part of the experimentation around Open Access being fostered and encouraged within the UC system at this time, punctum books is entering into a 2-year pilot partnership with UC Santa Barbara Library around open books in the Humanities and Social Sciences and has also joined forces with Open Access presses in the UK, Germany, and the Netherlands to form ScholarLed, a new consortium of Open Access book publishers that aims to create an ecosystem for open books in the Humanities and Social Sciences that is not-for-profit, community-driven, and led by academic researchers (as opposed to for-profit, commercial-conglomerate publishers such as SpringerNature, Elsevier, Taylor & Francis, and even legacy university presses which, increasingly, focus more on the bottom line than on the needs of researcher communities). In this talk, Eileen and Vincent will share their vision of the future of community-driven, scholar-led Open Access books as well as their experiences working with authors and editors within the UC system and with UCSB Library and ScholarLed. UC Berkeley will be hosting Choosing Pathways to OA, a free two-day working forum October 16-17 for North American library or consortium leaders and key academic stakeholders centered on action-focused deliberations about redirecting subscription and other funds toward sustainable open access publishing. Registration for this event has closed, but you can read more about it at the forum’s website. Berkeley will also be hosting a series of publishing workshops for grad students through the graduate professional development center, focusing on how publishing open access can help scholars build their careers.